For my entire life, even before I could cook, I’ve collected cookbooks. And while not all great cooks love books (and surely not all great readers like to cook), there is a great intersection between those of us who love to read and those of us who love to cook. The very best cookbooks are instructional, inspirational, and entertaining. My earliest memories are in the kitchens of my grandmothers’ homes. My maternal grandmother, Pauline McClain Hall, was not a good cook by the time I knew her (I think primarily because she had to cook for a family of six most of her life). As she grew into old age, she was a perfectly adequate cook, but mostly, she was intrigued by the food fads of the late 1960s: she loved Fresca and Tang, and always served Jell-O and canned Spaghetti-Os. And while I loved staying with her, I never learned too much about cooking from her. One of my big desires is to write a cookbook; I have a small booklet version that’s the beginnings of it. Perhaps I’ll finish it someday. In the meantime, I’m inspired by others who’ve written cookbooks or submitted recipes to cookbook collections. I’m a huge fan of these “club” cookbooks produced by Junior Leagues, church groups, and garden clubs across the country. In my little hometown of Dimmitt, Texas, the hospital auxiliary produced one of my favorites, We Can Cook, Too, which includes a number of recipes for a Texas favorite, HUSBAND PLEASIN’ Ranch Style Beans. 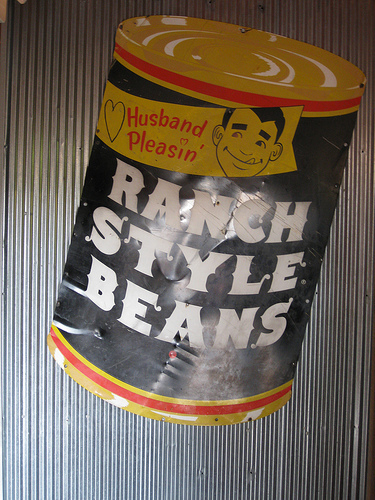 In the 1960s and 1970s, when these beans were still locally produced, the label actually said HUSBAND PLEASIN’. You can see now it says APPETITE PLEASIN’ Ranch Style Beans, but we all know what it used to say. Any self-respecting cook from the High Plains of Texas can make a meal starting with this can of beans: they’re perfectly seasoned pintos in a rich, spicy sauce that is neither sweet nor cloying. They’re a staple of my kitchen. Other friends have published cookbooks too. Kathy Starr wrote another little gem in my collection, The Soul of Southern Cooking. Kathy is from the Mississippi Delta, as is my husband. Another friend, also from the Delta, Vann Eugene Ham illustrated the cookbook, including his very kind inscription to me, on the occasion of a book-signing Kathy had at the National Archives in 1985. We’re all so used to the lush photograph that we forget how expensive it used to be to publish a book with four-color photographs. So, to both demonstrate techniques and to brighten the pages, publishers often chose to find an illustrator. A precious book in my collection is Betty Crocker’s Dinner for Two Cookbook: 491 Recipes and Menus including a “When Company Comes” Section. This book, published in 1960, was a wedding present to my parents. My mother reports that it was a popular gift for newly marrieds of their age. In addition to being a useful cookbook, it offers guidance for the new homemaker: it’s a lifestyle book with recipes thrown in along the way. There are sections on how to buy fresh goods and keep them from spoiling, how to buy for just two, and suggested menus. Dinner for Two has a few color plates, but the very talented Charles Harper primarily illustrated it in black and white. I always loved the drawings in this cookbook and found them so appealing and charming. And here (below), where the wife is hanging a Happy Anniversary banner to accompany her well-wrapped gift for her husband, all the while still in her apron. Some women, it is said, like to cook. This book is not for them This book is for those of us who want to fold our big dishwater hands around a dry Martini instead of a wet flounder, come the end of a long day. Whew! With a start like that, who wants to go further? Is it any wonder that women in the early 1960s were confused about their role in society? Peg Bracken published this book on the eve of the publication of Betty Friedan’s The Feminine Mystique, when women were walking out of the kitchen, into the workforce, and claiming their lives. Some women, that is. Others sat on the sidelines and watched, confused by what they were to do with this new-found freedom. Bracken walked them through with a keen sense of humor mixed with the reality that dinner still had to be put on the table. The book was beloved by rebellious housewives across the nation. Bracken’s premise was considered heretical: cooking is not joyful, and it should be done as quickly as possible, preferably with ingredients readily available in the cupboard. Its re-release in 2010 found a new audience with people tired of hearing about organic this and local that. Speaking of cooking, incidentally, and I believe we were: one of its worst facets is grocery shopping. When you hate to cook, a supermarket is an appalling place. You see so many things that they all blur, and you finally end up with a glazed look and a chop. So, take this cookbook along when you go shopping. Then when you see a can of shrimp, for instance, it might ring a faraway bell, and you can look in your little book to see what we’d do with it, we women who hate to cook. We’d commit: HURRY CURRY. I grew up thinking that this recipe, Hurry Curry, was authentic Indian food because it was all I ever knew. Canned shrimp, half a TEASPOON of curry powder, sour cream and frozen condensed cream of shrimp soup. Needless to say, I don’t make this for my own family, but it remained the most exotic Indian food my mother ever cooked and my father ever ate. Contrary to Betty Crocker’s guide to life—Dinner for Two—which contains great advice about being a good hostess, Peg has a strong opinion about guests. When you hate to cook, you should never accept an invitation to dinner. The reason is plain: Sooner or later, unless you have luckily disgraced yourself at their home, or unless they get transferred to Weehawken, you will have to return the invitation. You know this, of course. You keep reminding yourself. But it is like telling a small boy to turn down a free ticket to the circus. I’m always game for the circus, or at least a dinner invitation, because I greatly enjoy the “art of hospitality” and love entertaining in our home. My other grandmother was a wonderful cook and always welcomed company. Marion Ellis Lapins, my paternal grandmother, was a wild woman. Naturally thin, she was a grand cook, an adventurous eater, a woman who loved to be in the kitchen. She had four children and a husband to feed, and she loved to try new things. She was a voracious reader who clipped recipes (until she died) everywhere from the swap column of the Los Angeles Times to Gourmet magazine. And, carefully and neatly, she organized them into binders, creating her own cookbooks. I have stacks of her cookbooks, but two are worth noting. The first is Volume I of the Gourmet Cookbook, part of a two-volume collection of 10 years of recipes from Gourmet magazine. Much as we miss Gourmet magazine and Ruth Reichl’s wonderful annual compilation books, I think it’s grand to have this one from 1959, carefully annotated by Marion. It’s as good a cookbook as any I have: clear directions, an assumption that the cook knows what he or she is doing, pleasant illustrations, a limited number of color plates, and well-written introductions. Marion didn’t hesitate to make notes in her cookbooks, either, so I have her handwritten annotations: “Al didn’t like this” or “Add more onion.” While the Epicurious website can give us recipes, it is all these personal touches I miss. I purchased this cookbook, a translation of a 1903 cookbook, as a young bride in 1983 because I thought it was the cookbook to end all cookbooks. It was on my mother’s shelf, but never opened. It was also on Marion’s shelf, and I’m sure she used hers. Its cover is jet black, which conveys the impression of something dramatic. Interestingly, at the same time, I bought the Joy of Cooking, in its white faux leather cover. Black v. White. Impenetrable v. Accessible. While I’ve never followed one recipe in Escoffier from beginning to end, I still pull out the Joy of Cooking at least once every few months. But we could not have Joy without Escoffier. They are the bookends of textbook cookbooks: one simple, one complex. Both incredibly useful and each is better because of the contrast from the other. Prepare the shells as in #2982. Wash and dry the scallops and braise them gently with white wine and mushroom liquor. Border the shells with garnish of Duchess Potatoes (#221) piped on by means of a pastry bag and fluted tube. Brush with egg and brown in over before filling. Keep hot. Cover bottom of each shell with a teaspoon of white wine sauce (#45) to which a little chopped truffle has been added. Fill shells with prepared scallop, alternating these with slices of cooked mushrooms. Cover with the same white wine sauce and glaze. Serve immediately. Clearly, Escoffier is not for wimps, or people who like simple directions or simple food. But Escoffier revolutionized the professional kitchen: he simplified the menu, writing the dishes down in the order in which they would be served, and developed the à la carte menu. Escoffier was a pioneer with respect to the education of professional chefs, and this cookbook was their guide. Joy of Cooking was the guide to cooking for the rest of us. So too with the rest of my favorite cookbooks. Some of the books on the special shelf in my kitchen are inspiring and educational, while others are aspirational and exotic. They range from the simple to the intricate, the antiquated to the modern, handmade to professional. To earn its place, a cookbook must have a history or a personal story that binds it to my family, it must inspire me, and it must feed my creativity. This is the place I go, whether I need a tasty recipe or just a good read. Photo by Bradley P. Johnson, Creative Commons via Flickr. Post by Laura L. Willis. Laura Lapins Willis has been observing people and writing about them since she was 8 years old. Passionate about community, Laura has more than 25 years of experience in the nonprofit sector where she has managed, led, and inspired others to work for the common good. She is the author of the award-winning "Finding God in a Bag of Groceries" (Abingdon, 2013), a memoir about her faith while working at an outreach ministry in rural Appalachia. Laura is an accomplished speaker,an inspiring workshop leader, and an experienced teacher of writing and editing memoir. Thank you, Laura. I can’t wait to share these with you some day! Such a joy to read! I especially love the history. Clipping recipes—haven’t heard that term in years (although I did my fair share and have a dust-covered box in the closet to prove it). Isn’t that fun! For special events, I often pull out one of my old cookbooks for table setting guidance. Wouldn’t want to put the bread plate on the wrong side! So glad you enjoyed the essay, Sharon! I love this look at cookbooks through the years. My favorites have a story surrounding them–who gifted them to me or passed them down to me. Most of my recipes come off the internet now, and although the tastes are updates (lots more curry! ), the mystique is gone. Thank you, Megan! I too find I use my iPad as my modern guide to cooking, but I cannot part with these precious cookbooks! Those beans did say ‘husband pleasing’ at one time; I had totally forgot that. And I am absolutely thrilled at the idea of owning a cookbook by you. I’m a collector of cookbooks, without possessing the enthusiasm of the actual doing. I just love to browse and read. Thanks for the great blog post. I wish I had a picture of the beans with their old label, Natalie! Maybe that can be the title of my yet-to-be-published cookbook: Husband Pleasin’ Recipes! Thanks for stopping by! Indeed! Those are the very beans, in their original labeling! Oh, I love this, Laura. The clipping recipes discussion made me think of my mother’s recipe scrapbook that holds many, many tattered and worn recipes she clipped from newspapers and magazines over decades. There is so much we hold when we consider cookbooks and recipes and the act of preparing food (or even avoiding preparing food). Thank you for reminding me of this. Like Megan mentioned, I also often default to pulling up an online recipe. I think at least next time I’m looking for something, I’m going to pull one of my cookbooks from the shelf. Aren’t those clippings wonderful? And to think…. our children will never quite understand why we so carefully scissored recipes from a newspaper! I LOVED Peg Bracken’s cookbook; I believe she had a column in the Ladies Home Journal or somewhere. I know I have some of her recipes in my recipe box. What a walk down memory lane! Have you seen the site “Grace Table”? Great essays on food, cooking, hospitality. . . and recipes occasionally. Very good writers. Trisha Yearwood has a crazy fun cooking show on the Cooking Network. Katie: I think Pioneer Woman and I would be best friends if we ever got to meet in person! In the Food Network World, she is a breath of fresh air: authentic, calm, and loving. She’s wonderful. I haven’t seen Trisha’s show, but will look for it. I bet she’s got grace and hospitality at the forefront too. Happy times in the kitchen! Both Ree and Trisha are fun and gracious women. You can see it in how they care for and about their families and community. Would so love to take a trip to OK and see the Merc Ree and Lad have restored in Pawhuska. Peg Bracken was so witty and wonderful! I too remember her column in LHJ, right along with “Can this Marriage be Saved?” Great memories! A delicious essay! Love it! I tend to return to my cookbooks whose pages are splattered with grease stains and spots of who knows what. Is it true that messy cooks are good cooks? I sure hope so. Thank you, Lisa! These cookbooks, among my most beloved, have the scars of regular use: batter splashes, grease spots, and pages falling out of the bindings (especially “Dinner for Two”). I don’t know if messy cooks are good cooks…. but I know you ARE a good cook and if you’re messy, who cares! The food is always what brings people back to the table. This was so much fun to read! That advice on never accepting a dinner invitation had me laughing! It took me back to stories of my mom – how the claim was she couldn’t cook a thing when they got married – not even JELL-O (because, as the story goes, she thought “add 1 cup of HOT water” meant hot from the tap, not boiling, and so their JELL-O always had a thick leathery bottom and thin watery top). She grew into an amazing cook and I rarely ever saw her use a cookbook, though she had several…. she loved recipes on cards written out by hand from friends and family. I completely relate to your mother’s experience. I am old enough that I had a Home Ec class in high school, which I almost failed because I was a terrible cook. Couldn’t make a pie crust, or gravy, or pot roast. In the end, I just needed time and motivation to cook what I wanted. Those recipes on cards, handwritten and annotated, are the very best. What a wonderful piece! Your cookbook will be fabulous if this essay is any indication of what to expect. I, too, love cookbooks, from Vincent and Mary Price’s A Treasury of Great Recipes to Elizabeth David’s works. I’m going to have to find a copy of The I Hate to Cook Book. There have been more than a few times when it might have come in handy for me. Thank you, Debra, for the encouragement. I wonder if the world needs yet another cookbook, but folks do love them, even if they don’t always use the recipes. I don’t know the cookbooks you mention but will find them. And knowing you just a bit, I am sure that Peg Bracken will be an enjoyable addition to your dinner routines. The Prices’ is more just a book I got because of the names. David’s books are interesting in that she often weaves her recipes into her writing. We do indeed, Monica! Thank you for stopping by!